Under Armour has the Midas touch these days. Its star athletes are winning about every major award on the planet, and the company just announced its 21st consecutive quarter of 20% or more growth. 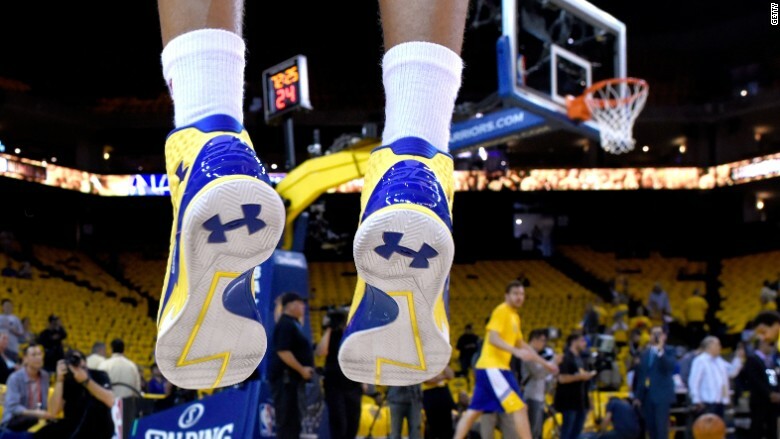 No wonder Under Armour (UA)stock hit an all-time high of over $97 a share on Thursday. It ended the day up over 7%. "I would like to go to the race track with [Under Armour CEO] Kevin Plank. He picks winners," says Corinna Freedman, an analyst at BB&T Capital Markets, who follows the company. The company's next goal is clear: Beat Nike (NKE). The basketball shoe market is central to that goal. Under Armour champs: Basketball superstar Stephen Curry wore Under Armour on his way to winning the NBA championship and becoming the most valuable player in the league. Young golfer Jordan Spieth surprised many by winning the Masters Tournament this year and followed that up by besting everyone at the U.S. Open. He, too, was sporting Under Armour attire. The Under Armour Curry One worn by Stephen Curry of the Golden State Warriors is seen as he warms up for the 2015 NBA Playoffs at ORACLE Arena on May 27, 2015 in Oakland, California. Under Armour is even crushing it in the world of ballet. Under Armour had run an iconic ad with Misty Copeland in the summer of 2014. And Copeland just became the first African-American dancer promoted to principal at the American Ballet Theatre. The brand knows how to win, and wants to translate that into more sales. In a good sign, Under Armour raised its 2015 forecasts. It now expects revenue to grow 25% this year compared to last year. "We want to see the success in golf in basketball and running," CEO Kevin Plank said on a call with analysts Thursday. "We want to win." The basketball play: Nike currently controls about 90% of the basketball shoe market thanks to the huge success of its Air Jordan brand. But Stephen Curry of the Golden State Warriors is the new face, and his shoes -- the Curry One -- are Under Armour. Wall Street analysts like Freedman are keeping a close eye on shoes sales. It will be a key indicator of just how strong the Under Armour brand is going forward, especially in the U.S. market. "We think the momentum is still there. They are riding a wave of incredible success this year that should help sales for next year," says Freedman. So far, there seems to be room for both Under Armour and Nike to play -- and profit -- in many sports. Both stocks are at all-time highs as Americans shift to "athleisure" wear. 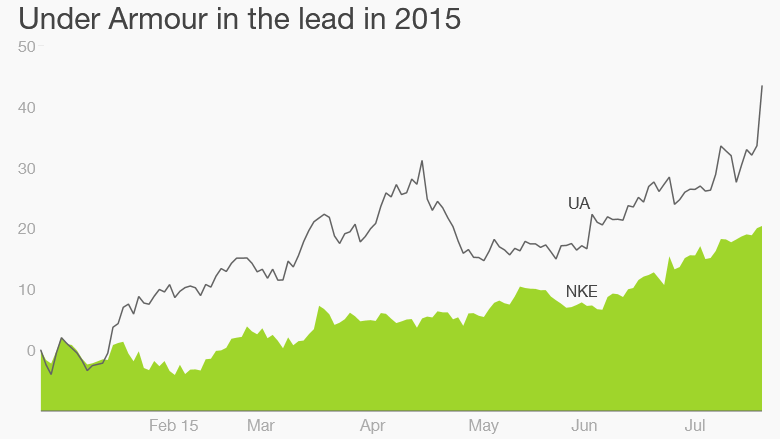 But Under Armour stock is pulling ahead so far this year. Nike is still the clear giant in the space. 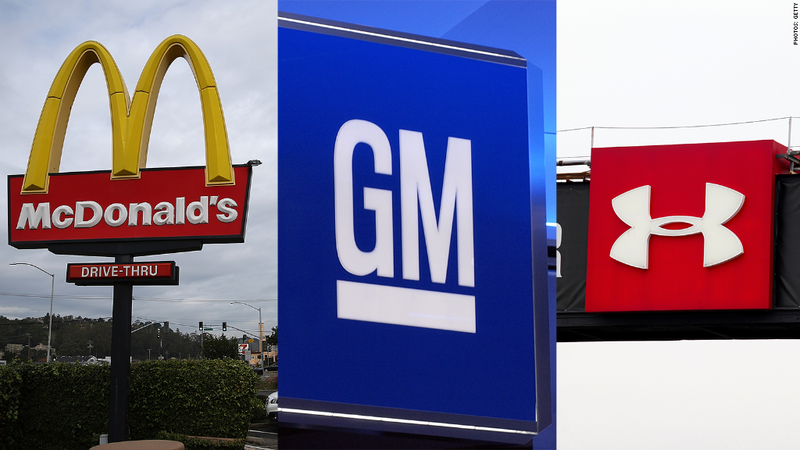 It has a market capitalization of $98 billion and sales this year of about $31 billion. Compare that to Under Armour, which has a market of nearly $21 billion and estimated 2015 sales of just shy of $4 billion, according to FactSet. Beyond shoes and shorts: The other big focus for Under Armour is growing a fitness community and being an early mover in the Internet of Things for the sports world. Under Armour claims it is adding a massive 100,000 new users a day to its Connected Fitness community platform. That's on top of the 140 million users already there. "I'm skeptical about the connectivity fitness thing," says analyst Paul Swinand of Morningstar. "Where is it leading? What's the strategy?" The signature piece of this vision is a gear tracker that allows people to track the performance of their shoes or other Under Armour pieces as they are working out. "Eventually everything we have will have a chip in it," says CEO Plank. "We hope to use this to sell more shirts and shoes." Even Swinand admits it's hard to doubt Under Armour lately. "When you have a great track record of success, you keep thinking you can do more," notes Swinand.